We continue to make headway in our quest to prepare the nursery. The room is almost (almost!) completely cleared of non-baby items and we were able to get rid of the futon today. That was taking up a lot of space. Well, ok, so my wonderful husband put it together. I primarily directed the operation, clutching the instructions and telling him what to do… all while helping to steady pieces a bit here and there as he assembled it. I really like it. It's called Sweetest Dreams Bassinet by Delta. 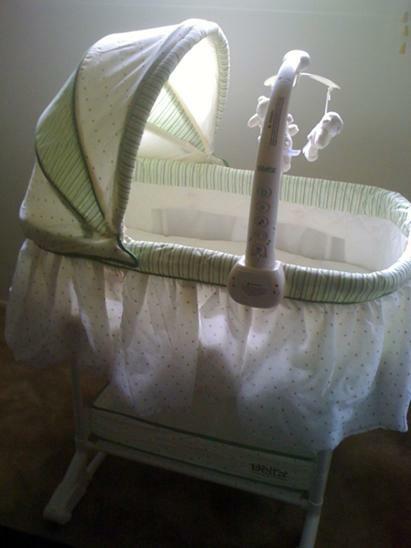 The bassinet is neutral in color (green!) and has adorable little lambs on the mobile. It can be in rocking stance or drop down the wheels to roll it. It seems pretty sturdy and doesn't appear to tip over easily when in the rocking stance. The mobile turns the lambs, plays music, blinks lights, and has a night light. So far, the cats have not tried to get into it. They've sniffed it a bit and laid near it…. Hopefully they won't try since it's kind of a high jump. 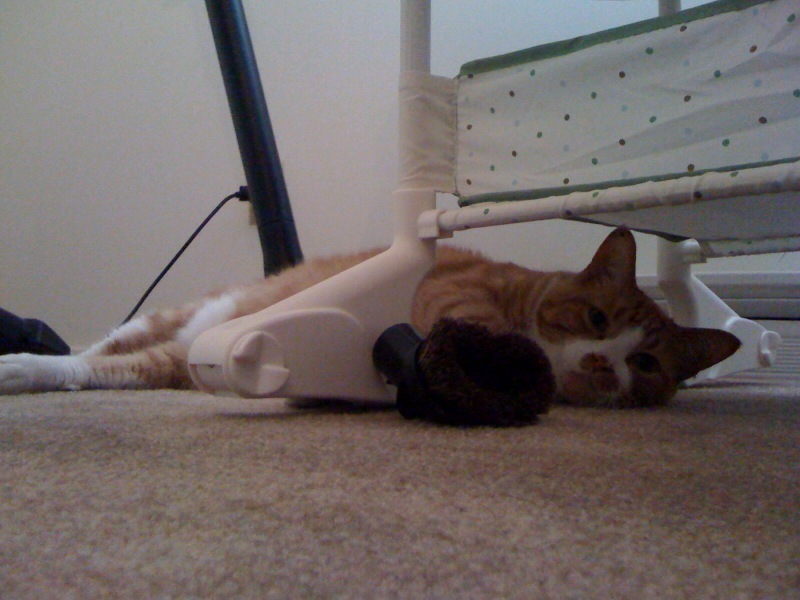 Our big orange tabby really likes that room. This is going to be very interesting. I'm sure he's starting to miss the futon quite a bit now. @Alexan – Good tip! I will try that if they start jumping in it. 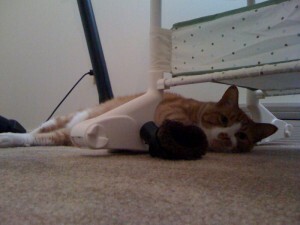 I certainly don’t want the cats to be afraid of going near the baby… I just don’t want them to lay ON the baby. The big cat is super cuddly and I know he’ll have the best intentions… just don’t want to risk any issues of him laying on the baby or tipping the bassinet over.